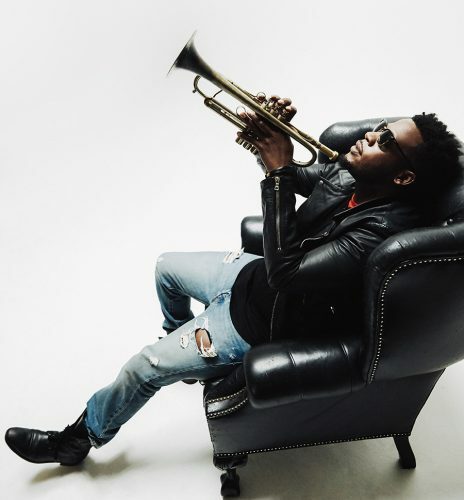 Keyon Harrold was born and raised in Ferguson, MO, the St. Louis suburb that tore into America’s national consciousness in 2014 with the police shooting of Michael Brown and the bitter protests and riots that followed. While Ferguson looms large in Harrold’s album The Mugician, it examines our troubled times through a far wider lens than any one tragedy. Sweeping and cinematic, the music draws on elements of jazz, classicval, rock, blues, and hip hop to create something uniquely modern, unmistakably American. Guests including Pharoahe Monch, Gary Clark, Jr., Big K.R.I.T., Guy Torry, Georgia Anne Muldrow and Robert Glasper add to the record’s eclectic nature, but it ultimately triumphs as a unified, cohesive whole both because of Harrold’s virtuosic skill as a trumpeter and songwriter and because of his relentlessly optimistic belief in brighter days to come. In 2009, he released his solo debut, Introducing Keyon Harrold and then won wide acclaim for his trumpet performances in Don Cheadle’s Miles Davis biopic Miles Ahead. The Mugician is a portmanteau of “musician” and “magician, a nod to a nickname Cheadle bestowed upon the young virtuoso, and it’s an apt descriptor for a record that pushes beyond the traditional boundaries of jazz trumpet. In fact, the album doesn’t even begin with trumpet, but rather with a track called ‘Voicemail,’ which features an inspirational message from Harrold’s mother set to a stirring, orchestral soundscape. Entirely unedited, her words lay the groundwork for an album that celebrates the importance of family (ten of Keyon’s siblings appear on the record) and the absolute necessity of optimism in the face of darkness and doubt. These days, Harrold is a parent himself, and he pays tribute to his son with a pair of tracks on the album, “Lullaby” and “Bubba Rides Again.” Issues of identity and equality percolate throughout the record, sometimes subtly beneath the surface, sometimes more pointedly, as in “Circus Show.” However, the album’s most powerful moments come with the one-two punch of “MB Lament” and “When Will It Stop,” songs written in the wake of Michael Brown’s death and the senseless killings of so many others like him.